Chiropractic care accounts for 40% of people who sustain lower back pain following a motor vehicle accident (MVA). A third of patients also seek this treatment for spinal pain. So how effective is chiropractic? Well, according to one study, 93% of whiplash patients enjoyed improved symptoms following a treatment plan with their local chiropractor. These figures demonstrate just how effective chiropractic can be as an auto injury treatment – and we’ll explore this in more detail below. 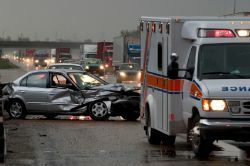 Who Should Seek Auto Injury Treatment? Following a car accident, you may notice a number of symptoms arising within 24 hours. This can include pain in your back and neck, which perhaps extend into your feet and legs. You may also feel nauseous, dizzy, and have blurred vision. Even though these symptoms are common and are to be somewhat expected after an MVA, you shouldn’t assume they’ll just disappear with time. Most people will need treatment for these aches and pains and simply “walking them off” won’t do. Ultimately, your spine plays a huge role in your anatomy and day-to-day life, and when its health has been compromised in an accident, it’s crucial you visit your chiropractor in Decatur for their specialist advice – even if you don’t have any symptoms. What Can You Expect from Chiropractic? Chiropractors specialize in treating the spine and back muscles/tissues. But they’re also qualified to provide you with an accurate diagnosis for conditions involving your back and neck. Therefore, when you attend your first appointment with the chiropractor, they’ll examine your back to see what’s causing your symptoms. This allows them to put together a unique treatment plan that targets the specific condition you’re suffering from. In most cases, after a car accident, their primary focus will be to move your spine back into its original position. This involves placing gentle force on the area and massaging the surrounding muscles. By doing this they’ll encourage your spine to realign itself. Your treatment program may involve numerous sessions with your chiropractor, but most patients feel the benefits after the very first session. And your chiropractor may also give you some easy-to-follow exercises to do at home to boost your recovery success. Back and neck pain can have a detrimental impact on your life, so don’t suffer in silence. Pick up the phone and dial 404-325-3609 to arrange your first appointment with our dedicated team.